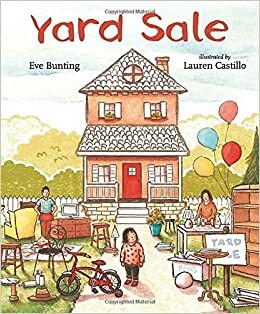 Summary: Callie’s family is about to move into an apartment, and they are having a yard sale to sell what they can’t take with them. Callie’s bed is sold, because the new apartment has a bed that pulls out of the wall, and her bicycle because the family will be living on a busy street with no sidewalk. Her best friend comes to see how it’s going, and asks Callie to remind her why they’re moving. “It’s something to do with money,” says Callie. A woman tells Callie she’s “the cutest thing” and asks if she’s for sale, which scares Callie. Her dad hugs her and assures her that he would never sell her for any price. She realizes that as long as her family is together in her new apartment, it will feel like home. Pros: A heartwarming story which could also serve as bibliotherapy for children in a similar difficult situation. Cons: You may get a lump in your throat on more than one page. 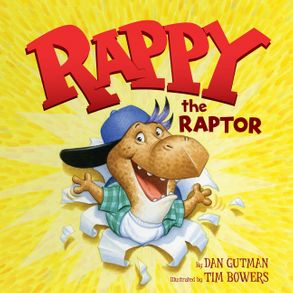 Rappy the Raptor by Dan Gutman, illustrated by Tim Bowers. Summary: “Now, how did it happen that I started rappin’? Well, here’s my story in all its glory!” The first time Rappy the Raptor tried to fly, he fell on his head; when he came to, he was talking in rhyme non-stop. His parents took him to the hospital, where he underwent a battery of tests. The final verdict? The fall had nothing to do with it; Rappy was born to rap. So Rappy leaves the doctors and nurses bopping and snapping their fingers, and goes on to his happy life of rhyme. Recommended for ages 3-7. Pros: Snappy rhyming text and lively cartoonish illustrations of dancing dinosaurs. Cons: If non-stop rhyming results in the number of tests that Rappy undergoes, it’s no wonder our healthcare system is troubled. Summary: What if real-life contemporaries Harriet Tubman and Susan B. Anthony had met? This book imagines a conversation between these two women who worked tirelessly their whole adult lives to improve the lives of women and African-Americans. 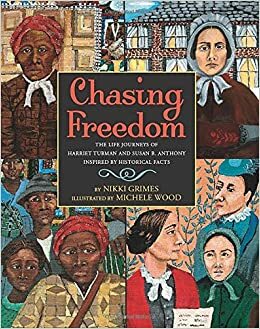 They tell each other true stories about themselves and some of the other people they worked with, like John Brown, Elizabeth Cady Stanton, and Frederick Douglass. The women relate their stories in alternating pages, just like a real conversation, and each page is illustrated with a folk art style painting. The end pages includes brief biographies of the two women and fourteen other people who were involved with similar work; additional notes about some of the events of the period; a bibliography; and an author’s note about how she came to write the book. Pros: This is a unique and engaging way to learn about these two very interesting women who blazed their own trails and made a difference in many lives. Cons: Kids will need some historical context to fully appreciate this book. 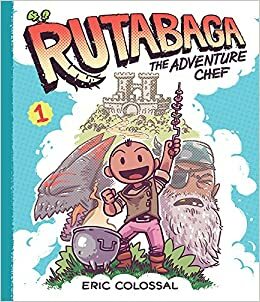 Summary: Rutabaga is a chef in search of adventure when he runs into Winn, Manny, and Beef, three young knights off to slay a dragon. Rutabaga decides to join them, along with his magical cooking pot. Knowing his limitations, he stays in the background when they find the dragon, but accidentally ends up being responsible for defeating it. The four kids continue on their way onto three more loosely connected comic adventures that have Rutabaga using all his cooking skills and optimistic attitude to consistently come out on top. Grades 2-4. Pros: Graphic novel fans will enjoy Rutabaga and his friends. The stories are engaging, funny, and not too challenging for young readers. Cons: I had a little trouble distinguishing the four characters. I didn’t realize that Winn(ifred) was a girl until the beginning of chapter three. Summary: Summer’s not looking too exciting for Billy. His parents have recently separated, and he’s staying with his mother at a lakeside cabin that has no TV. Forced to read books, he discovers that whatever he reads comes to life on an island in the middle of the lake. Billy teams up with his neighbor Walter as well as Robin Hood, Tom Sawyer, Pollyanna, and Hercules to find treasure that’s supposed to be buried on the island. Their efforts are constantly thwarted by the Sheriff of Nottingham, Jack’s giant, and the neighborhood bully. As fun as the adventures are, the questions remain: who is Dr. Libris and why does his library come to life on the island? In his quest to learn the answers, Billy learns about the power of his own imagination. Recommended for grades 4-6. Pros: Lots of action, humor, and some fun puzzles to solve. Cons: Many of the literary allusions may be lost on readers not familiar with the classics. Summary: Bryan Collier has illustrated books by famous African Americans such as Martin Luther King, Jr., Rosa Parks, and Langston Hughes. Now he has collaborated with musician Troy Andrews to tell the story of Troy’s early life. From a very young age, Troy looked up to his musician brother James and made music with whatever he could find. 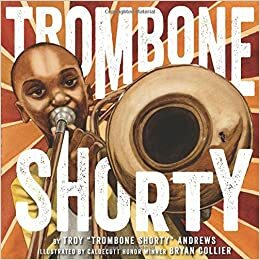 When he was four, he found a broken-down trombone and taught himself to play, taking it with him wherever he went, and earning himself the nickname Trombone Shorty. When his mother took him to the New Orleans Jazz & Heritage Festival, he took his trombone and played along with Bo Diddley. Bo stopped and asked who was playing. The crowd passed young Troy up to the stage and the two played together. Now Trombone Shorty has his own band, as well as a foundation to help other young musicians in New Orleans. Pros: Troy tells his story with a distinctive voice influenced by his New Orleans childhood. Collier’s watercolor collage illustrations really capture the feel of New Orleans jazz. Back matter includes more information about Andrews’ life and a note on how the illustrations were created. Cons: A person born the year I graduated college is an award-winning musician with his own foundation. Summary: Nate is the unluckiest boy in the whole town of Paradise Beach, Florida. Fortunately, he has a good friend, Genesis (Gen), who sticks with him no matter how many unlucky things happen to him. His bad luck culminates on his birthday, when he’s struck by lightning while playing miniature golf. When he regains consciousness, he slowly begins to realize that his luck has changed. The toaster that always burned his toast now toasts it to golden perfection. He fixes engines just by touching them. And the kids who used to bully him and Gen now want to be his friend. 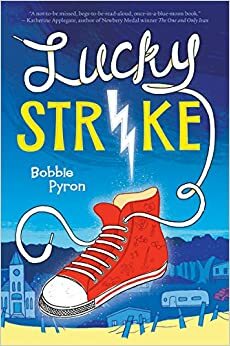 It’s all great fun at first, but gradually his new-found luck begins to take him away from Gen, and he starts to wonder if people like him for himself or his good luck. Will it take another force of nature to get Nate’s life back on track? Recommended for grades 4-6. Pros: Great setting, quirky but not too quirky characters, and a fun plot. Cons: The story was a little slow in parts.